This revised and updated book is an effective vocabulary builder especially recommended for students preparing to take the SAT and ACT college entrance tests. More than 2,000 words frequently found on the tests are defined and placed in model sentences. Students hoping to achieve high SAT and ACT scores should know how to use every one of these words. 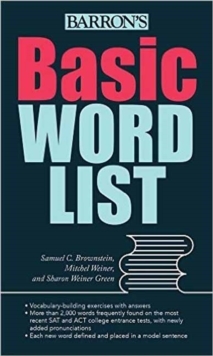 The book also includes vocabulary-building exercises following every group of 40 new words, and a helpful review of word prefixes and roots.